This is the fourth in a series on using bioenergetics as a guiding model to train more effectively for aerobic power. This epic 90-minute episode breaks down the nuance of properly training both the climbing-specific and generalized aerobic energy system—a critical and often-overlooked metabolic pathway that contributes significantly to power production in climbing and, importantly, drives most of the recovery process between moves, crux sequences, routes, and even boulder problems. There’s lots of gold to mine from this podcast, especially for already highly training intermediate to elite climbers. I hope you enjoy it! Andy Raether on the first ascent of Manphibian (5.14d), Mt. Charleston, NV. Courtesy of Lacey Jones. 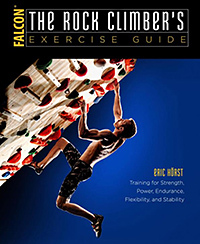 00:15 – Eric’s Intro to training the aerobic energy system…and its high importance to rock climbers. How the energy system conceptual model can empower you to train smarter and get more out of your training investment. 4:45 – If you think these podcasts are gold, then why not share it with your friends….and please leave a review on iTunes! 5:15 – All about the aerobic energy system and how it differs from the other two energy systems. Of course, all three energy systems contribute to ATP production, but there are certain climbing situations that call heavily on the aerobic energy system. 9:15 – A quick review of the three energy systems, when each dominates, and how the aerobic system comes into play for climbers. Learn why and when the anaerobic energy systems power down and eventually fail you…and how the aerobic energy system can only provide a sustained “critical power” of only about one-third of your peak power. 15:35 – How the aerobic energy system supports the ATP-CP energy system. Important stuff, especially for rope climbers…but really for all climbers. 18:20 – How the aerobic system supports the anaerobic lactic energy system. Yes, a stronger aerobic system can help you control the “pump”; but it’s also important that you strive to improve climbing economy and reduce the ATP cost of a given move or sequence—this is a hugely powerful distinction! 21:55 – A quick reminder on the importance of increasing maximum strength and power, season over season, because this sets the ceiling for your peak power output and anaerobic capacity. 23:50 – A detail discussion of the bioenergetics of finger flexor muscles and how finger grip intensity determines the energy system most used. Occlusion of blood flow is the critical factor, and maintaining blood flow as much as possible is one of the secrets of elite climbers. 28:45 – The physical prowess of Adam Ondra is both his large anaerobic reserve (capacity) AND high aerobic power! 30:35 – What climbing researchers have measured in the lab with regarding to the bioenergetics of climbing. (A truly climbing-specific VO2 test has yet to be developed and validated for testing at the gym.) The importance of not conflating generalized aerobic fitness (and VO2) with climbing-specific aerobic development (and VO2). 32:34 – Moving from theory to practice…here we begin to look into targeted training of the finger flexors and pulling muscles (the rock climbing agonists). 34:09 – What adaptations take places in the climbing muscles that improve aerobic power? Adaptation #1 in an increase in capillary density which results in a decrease in diffusion distance—importantly, this contributes to increasing O2 kinetics. Simon Fryer’s research showed that elite climbers have higher O2 kinetics than lesser climbers. 37:50 – Adaptation #2 is an increase in aerobic enzymes…which can upregulate in just a matter of days to a week or two of aerobic-centric training/climbing. 40:15 – Adaptation #3 is mitochondria adaptations—critical for long-term development year over year…and for maintaining climbing-specific VO2 into middle age and beyond. 43:30 – Important point: Intracellular acidosis negatively impacts mitochondria function. This explains why a vicious flash pump (due to a poor warm up) can hurt same-day climbing performance…and why chronic acidosis (too much time spent anaerobic lactic training/climbing per week) can decrease aerobic power and contribute toward onset of overtraining syndrome. 45:15 – The difference between “aerobic power” and “aerobic capacity”. Which matters more for you? 48:32 – ARC climbing. This involves easy, long, very submaximal (3 or 4 number grades below your limit) climbing for 30 to 60 minutes. It must be fairly low in intensity with no complete occlusion of forearm blood flow—you mustn’t succumb to the “pump lust”. Learn the pros and cons of ARC training. 53:10 – Threshold Intervals—perhaps the best approach to aerobic development for the mass of climbers. Unfortunately, getting the intensity right can be difficult—it can’t be too hard (too anaerobic) or too easy (too far below the aerobic threshold). For most people the target intensity is an 8 out of 10 as the end-of-set physical intensity and perceived exertion. A light pump and small increase in breathing rate is fine, but not a deep pump or heavy breathing (which signals anaerobic metabolism dominates). 59:36 – Alactic-aerobic intervals. For elite climbers, this is a go-to strategy for increasing aerobic power for high-level bouldering and sport climbing. This is NOT a training method for beginner or intermediate climbers, however, because it requires a high base level of strength and power. This is a tricky exercise protocol to get right—nuance, self-awareness, and discipline are essential to do it right and get the desired training adaptations. A Treadwall and Endless Rope machine are ideal tools for Alactic-aerobic intervals. Listen closely for the critical details! 1:09:48 – How to train the climbing-specific aerobic system if you don’t have access to a climbing wall. Here, I describe two exercises using a hangboard or campus board: “moving hangs” and “low-intensity repeaters”. As with the previous exercises, getting the training nuance right is essential to gain aerobic system adaptations—specifically, your finger grip force must be only 20% – 30% of maximum so as to not completely occlude blood flow and go deeply anaerobic. 1:13:20 – A quick look at generalized aerobic training…running, bicycling, rowing, swimming, trail running, etc. 1:15:00 – What climbing researchers have determined with regarding to the VO2 max of climbers…and the need and benefits of generalized aerobic fitness and training. 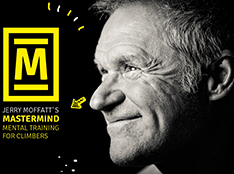 1:18:00 – Does generalized aerobic training really help performance? 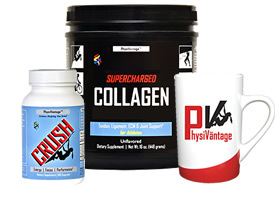 Might it hurt climbing performance? Is it a priority or a secondary need? How often should you do it? Learn all these details and more here! 1:23:20 – What days and time of days should you do your aerobic training? Tips and tricks for getting the most out of your aerobic system training…and how to integrate it with your other training for best results. 1:26:16 – Wrap up, closing comments, and final tips on energy system training. 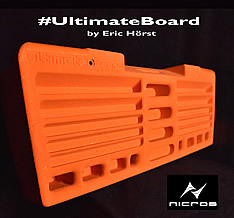 This stuff IS the future of training for climbing! 1:27:10 – Comments about the International Rock Climbing Researchers Association (IRCRA) meeting in Chamonix, France where I’ll speaking in July…and Eric’s closing comments. 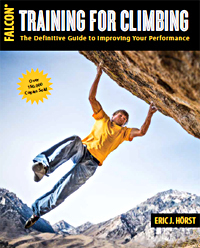 For more on energy system training (and a myriad other training tips and techniques) pick up a copy of the latest edition of the best-selling Training for Climbing.